PsyD, Senior Equity Manager, Local Unit of Health of Ferrara; Professor in Charge of Gender Sociology and Vice Director of University Center for Studies on Gender Medicine, University of Ferrara. Received 2 August 2018; accepted 21 November 2018. Summary. The social and individual interpretations of old age influence wellbeing in this phase of life. Consider ageism, that is a discrimination based on age, and the self-directed role of ageism in a gender-sensitive consideration can be useful in describing the complex experience of old age in the contemporary world. The specific attention at “rite of passage” of retirement can add awareness to disease acquisitions. The pre- and post-retirement phase in workers’ lives can be characterized by difficulties and the acquisition of specific diseases in this phase of life. The loss of the working role, hence of a certain social identity, has a diverse impact on women and men, maybe connected by gender that causes different reactions. A specific knowledge of the socio-psychological and gender dynamics of this important stage of life is necessary for the contemporary era with increasingly aging population, dealing with new existential meanings. The study reveals a shared agreement on how retirement has a more detrimental effect on men, especially those who adhere more to traditional masculine roles, who suffer most from the loss of social role, leading to important consequences in terms of physical and mental health. As for women, the researchers show that other variables influence more women’s health at the time of retirement, such as marital status and work history, maternity and geopolitical area of life, with more complex implications on their well-being. Key words: gender differences, gender stereotypes, old age, ageism, rite of passage, retirement. Riassunto. L’interpretazione sociale e individuale della vecchiaia influenza il benessere di questa fase della vita. Considerare l’ageismo, cioè la discriminazione in base all’età, e il ruolo dell’ageismo auto-diretto in una interpretazione sensibile al genere può essere utile per descrivere il complesso vissuto contemporaneo della vecchiaia. L’attenzione specifica al “rito del passaggio” del pensionamento può aggiungere consapevolezza sulle difficoltà e sulle acquisizioni di malattie in questa fase della vita. La fase della vita pre e post-pensionamento dei lavoratori può essere caratterizzata da difficoltà e dall’acquisizione di malattie specifiche. La perdita del ruolo lavorativo, quindi di una certa identità sociale, ha un impatto diverso su donne e uomini, verosimilmente legato al genere che causa reazioni diverse. Una conoscenza specifica delle dinamiche socio-psicologiche e di genere di questa importante fase della vita è necessaria per l’era contemporanea con una popolazione sempre più anziana, coinvolta in nuovi significati esistenziali. La ricerca rivela un dato che trova tutti d’accordo su come il pensionamento abbia un effetto più dannoso sugli uomini, specialmente su quelli che aderiscono maggiormente ai ruoli maschili tradizionali e che soffrono maggiormente per la perdita del ruolo sociale, determinando conseguenze importanti in termini di salute fisica e mentale. Per quanto riguarda le donne, i ricercatori mostrano che altre variabili influenzano maggiormente la loro salute rispetto al pensionamento, come per esempio lo stato civile e la storia lavorativa personale, la maternità e l’area geopolitica di vita, con implicazioni più complesse sul loro benessere. Parole chiave: differenze di genere, stereotipi di genere, vecchiaia, ageismo, riti di passaggio, pensionamento. Ageing shows the same differences between women and men as in the previous stages of life and, as gender factor, it is associated with stereotypes that create a specific age-stigma: ageism1,2. In 2017, people aged 65 or over represented almost one fifth (19%) of the EU population. Most of the policy focus concerns social expenditure generated by the aging population to provide a range of related services3. North and Fiske4 warn how problematic it is to consider the generic category of “older people” as one group. Therefore, ageism research and policy matters conceptualize everyone over-65 as “senior.” This tendency often fails to represent accurately subtyping ageism to consider a rapidly growing, diverse, and healthy older population mostly composed of people aged 65 to 74 (young elderly) but also over 75 (old elderly) and confirm old age strictly as diseases and death. The stereotypes concerning elderly people are still at a time when the over-fifty population is less numerous and not in good health. For the current generation of elderly people, one must not underestimate their potential as experts; on the other hand, it is necessary to think about social policies that envisage a cultural and social stimulation even in old age, both for personal well-being and to prevent future costs, social problems of degenerative diseases. Many physical signals and social factors determine the entry into the specific category of “elderly” in the common perception. Compared to young people, older people can be perceived to be less happy, less decision-makers, less active, and less autonomous5. In this way, an elderly person risks behaving in an incompetent - negative way, to comply with the stereotypical social thought about their life. Butler2 was the first to coin the word “ageism” as “[a] process of systematic stereotyping or discrimination against people because they are old, just as racism and sexism accomplish with skin colour and gender. Ageism allows the younger generations to see older people as different as themselves; thus, they subtly cease to identify with their elders as human beings.” Ageism is the most prevalent type of discrimination, reported by almost 35% of all participants over the age of 18 in a recent European Social Survey (cit. in Ayalon, Tesch-Römer, 2017)6. Elderly people tend to view negatively “self-directed ageism” according to social discrimination, a phenomenon that represents a risk for increased morbidity and mortality7,8. However, elderly people frequently discriminate individuals who are older or more disabled than themselves, particularly versus women9. In 1972, Susan Sontag10 described the effective and famous definition of “double standard of aging”, referring to the social convention that enhances a man but progressively destroys a woman. Sontag noted indeed that older women are more negatively valued than older men, especially because the “most valued social asset” for women, i.e., physical attractiveness, diminishes, while men older see their “most precious social resources” increase, which in their case, consist of earning potential and wealth. Retirement is the point of transition from one’s position or occupation or from one’s active working life and therefore marks a signiﬁcant moment in life and a change for young elderly people associated with the end of participation in the workforce, and changes in lifestyle and social roles11. Research on the labour market shows that there are gender differences that have been persistent over time although the nature and magnitude of these differences have changed; these influence several important areas: wages, workforce participation, the likelihood of receiving a pension, with women permanently disadvantaged12. Data from the European Social Survey for a subset of fourteen countries in the European Union examined the so-called “gender paradox” on gender differences in subjective job satisfaction assuming that women place higher value on certain work characteristics than men, thus explaining the observed differential. Women continue to report higher levels of job satisfaction than men in some countries, and the difference remains even after controlling for a wide range of personal and job characteristics and working conditions. Gender differences in job characteristics contribute relatively more to explaining the gender job satisfaction differential13. Accordingly, present-day workforce participation patterns of older individuals are extensively varied. In addition, the loss of the working role, hence of a certain social identity, has a diverse impact for women and men, connected by gender that causes different considerations and preventable consequences on the physical and mental health of elderly women and men. A specific knowledge of the socio-psychological and gender dynamics of this important stage of life is necessary for the contemporary era with an increasingly aging population, dealing with existential meanings14. Health is a variable often associated with satisfaction in retirement such as income, social integration, and gender differences. Men, for example, are more likely to have continuous work histories with long-term health implications; in comparison, women frequently experience discontinuous employment patterns and less attachment to the work role. As a result, their mortality and morbidity rates in retirement are not as frequently linked to occupational factors15. Self-esteem in retirement is dependent on pre-retirement self-esteem and pre-retirement planning, regardless of gender. Researchers comparing the psychological well-being of women and men in retirement indicate that women experience more depression and loneliness in retirement than men, thus reducing their retirement satisfaction16. A number of studies examined associations between retirement and mental health showing that earlier retirement is associated with poorer mental health. People who retired before normative retirement age had the worst physical and emotional health outcomes. The Whitehall II cohort study reveals that retirement due to ill health was associated with poorer mental health and physical functioning at follow-up, whereas voluntary retirement was associated with a short period of better health17. The study by Vo et al18 confirmed several interesting aspects of retirement. In cases in which retirement can take place when women and men consider it the right time, which they expected and that had already seen them as protagonists, the transition is positive and increases well-being. If, on the other hand, retirement is anticipated by unintended situations, for example dismissal, acquired disability, or otherwise ill health or by external pressures such as the need to take care of a sick or disabled family member, the change due to retirement coincides with a sudden loss and is not appreciated for the role of contacts with the social networks of habitual reference. These are aspects that often have negative consequences on mental health and this applies equally to women and men if they are under 65 years of age. Retirement for dismissal gives more psychological distress in both genders if it starts at age 55. Among retirees due to dismissal, men were more numerous, while among those who take care of relatives, women are more numerous. In comparison with men, women show that they do not consider retiring from paid work as the equivalent of closing themselves to active life. In fact, they are involved in a “multitude of social, community, religious, leisure and care activities”. On the other hand, men show that they suffer the most for the loss of social role, especially if linked to traditional masculine roles. Data in accordance with the study by Byles et al.19 show that retirement is associated with psychological distress among men, specifically those who have, in addition, a high level of physical dysfunction. Research on retirement has not considered the influence of marital status (i.e., married, remarried, widowed, divorced/separated, never married) on women’s retirement satisfaction. Previous studies have measured retirement satisfaction using existing tests, for example, the Retirement Descriptive Index (RDI) and the Life Satisfaction Index-Z (LSI-Z), or the Retirement Satisfaction Inventory (RSI). However, Quick and Moen20 measured using a one-item measure: “How satisfied are you with retirement?”. Price and Joo21 used a self-administered questionnaire among 331 retired women to report on their retirement satisfaction, psychological well-being, and perceived health, and revealed that retirement satisfaction and perceived health differed by marital status. Retired unmarried women experience more social isolation, a loss of social status, reduced self-esteem, more severe depression, lower perceived health, and greater economic insecurity in retirement than men. The results of Price and Joo indicate that retirement satisfaction and perceived health scores differ between retired women with different marital histories and married and remarried women appeared to have an advantage in retirement, specifically relating to perceived health and satisfaction. The data from the 2008 US Health and Retirement Study (HRS) reveal specific characteristics for married women. They are less likely than unmarried women or men to expect to work after ages 62 and 65. Married women are more likely than any other marital status/gender group to plan to stop working in retirement, and particularly they are less likely to plan on working with reduced hours and they are expected to stop working and reduce hours earlier than their unmarried or male counterparts22. From Sontag’s studies (few) that subsequently took into account age and gender (for example, Canetto et al. 1995)23, a rather differentiated picture emerges. An interpretation of the double standard of aging seems necessary, since the data do not always confirm an oppression only against women and an excessive simplification of a rather complex social phenomenon should be avoided24. Retirement as a missed “rite of passage” deserves more attention. Most research on retirement is limited to studying the phenomenon in general and does not go into the details of analysis of what constitutes this important passage of life, differently for women and men. The few gender-oriented data obtained reveal that retirement is associated with psychological distress among men more than women, but, perhaps due to the standardized research methods (multicentre research may be better), or superficial attention to the gender factor not connected with a gender shaping methodological application, we realize that there are few data concerning experience, emotions, and fears, both before and after retirement. More research is needed and it should be detailed and attentive to cultural differences existing between genders and identify the effects looking at whether and how pensions and gender can represent new risks for workers25. 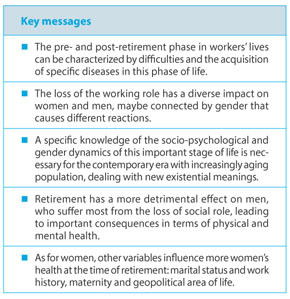 Exploring the gender meaning of retirement is useful to suggest the appropriate personal and collective preparation, in reducing the effects of living this phase of life negatively26-28. It should not be forgotten that the necessary “renegotiating identity” that retirement forces in women and men29 must be known and managed by the protagonists themselves. 1. Canetto SS. Older adult women: issues, resources and challenges. In: Handbook nof the psychology of women and gender. New York: Wiley 2001, 183-97. 2. Butler RN. Age-ism: another form of bigotry. Gerontologist 1969; 9: 243-6. 4. North MS, Fiske ST. Subtyping ageism: Policy issues in succession and consumption. Soc Issues Policy Rev 2013; 7: 36-57. 5. Arcuri L. Il difficile ruolo sociale dell’anziano. Stereotipi sulla base dell’età. Psicologia contemporanea 2016; 253: 12-17. 6. Ayalon L, Tesch-Römer C. Taking a closer look at ageism: self- and other-directed ageist attitudes and discrimination. Eur J Ageing 2017; 14: 1-4. 7. Levy BR, Slade MD, Kunkel SR, Kasl SV. Longevity increased by positive self-perceptions of aging. J Pers Soc Psychol 2002; 83(2): 261-70. 8. Levy BR, Zonderman AB, Slade MD, Ferrucci L. Age stereotypes held earlier in life predict cardiovascular events in later life. Psychol Sci 2009; 20(3): 296-8. 9. Dobbs D, Eckert JK, Rubinstein B, et al. An ethnographic study of stigma and ageism in residential care or assisted living. Gerontologist 2008; 48(4): 517-26. 10. Sontag S. The double standard of aging. The Saturday Review, New York, 1972, September 23: 29-38. 11. Ekerdt DJ. Frontiers of research on work and retirement. J Gerontol B Psychol Sci Soc Sci, 2010; 65B(1): 69-80. 12. Dahl S-A, Nilsen OA, Vaage K. Gender differences in early retirement behaviour. Eur Sociol Rev 2003; 19(2): 179-98. 13. Hauret L, Williams DR. Cross-national analysis of gender differences in job-satisfaction. Industrial relations 2017; 56(2): 203-35. 14. Radl J. Labour market exit and social stratification in Western Europe: the effects of social class and gender on the timing of retirement. Eur Sociol Rev 2012; 29(3): 654-68. 15. Moen P. A life course perspective on retirement, gender, and well-being. J Occup Health Psychol 1996; 1: 131-44. 16. Kim JE, Moen P. Retirement transitions, gender, and psychological wellbeing: a life-course, ecological model. J Gerontol B Psychol Sci Soc Sci 2002; 57(3): 212-22. 17. Jokela M, Ferrie JE, Gimeno D, et al. From midlife to early old age: health trajectories associated with retirement. Epidemiology 2010; 21: 284-90. 18. Vo K, Forder PM, Tavener M, et al. Retirement, age, gender and mental health: ﬁndings from the 45 and up study. Aging Ment Health 2015; 19(7): 647-57. 19. Byles JE, Vo K, Forder PM, et al. Gender, mental health, physical health and retirement: a prospective study of 21,608 Australians aged 55-69 years. Maturitas 2016; 87: 40-8. 20. Quick HE, Moen P. Gender, employment, and retirement quality: a life course approach to the differential experiences of men and women. J Occup Health Psychol 1998; 3: 44-64. 21. Price CA, Joo E. Exploring the relationship between marital status and women’s retirement satisfaction. Int J Aging Hum Dev 2005; 61(1): 37-55. 22. Szinovacz ME, and Gerontology Institute, University of Massachusetts Boston. Gender and marital status differences in retirement planning. Gerontology Institute Publications 2013; 88. 23. Canetto SS, Kaminski PL, Felicio DM. Typical and optimal aging in women and men: is there a double standard? Int J Aging Hum Dev 1995; 40(3):187-207. 24. Kornadt AE, Voss P, Rothermund K. Multiple standards of aging: gender-specific age stereotypes in different life. Eur J Ageing 2013; 10(4): 335-44. 25. Shuey KM, O’Rand AM. New risks for workers: pensions, labor markets, and gender. Annual Review of Sociolology 2004; 30: 453-77. 26. Loretto W, Vickerstaff S. The domestic and gendered context for retirement. Human Relations 2012; 66(1): 65-86. 27. Lanning, KL. Time for myself, time for others: gender differences in the meaning of retirement. Sociology Honors Projects, 2012, Paper 36. 28. Karpen KK. Reflections on women’s retirement. Gerontologist 2017; 57(1): 103-9. 29. Barnes H, Parry J. Renegotiating identity and relationships: men and women’s adjustments to retirement. Ageing & Society 2004; 24(2): 213-33. Mucchi Faina A. Troppo giovani, troppo vecchi. Il pregiudizio dell’età. Bari: Laterza, 2013.